In case you missed it in the Daily Freeman, curfews are set for both the Town and City of Kingston. Town of Kingston: 8:00pm for those 16 and under. City of Kingston: 7:00pm for those 16 and under. Kingston Land Trust partners Diane Reeder (The Queens Galley) and Diane Davenport (Binnewater Ice) approved the mission and business plan for turning the South Pine Street Garden into a ‘Farm’ under the stewardship of Farmer Jesica Clark. Community outreach and a press release will be available in the coming months. In the meantime, Jesica will begin preparing the plot in it’s entirety to include erecting a fence, doing soil tests, bringing in compost and other augmentation and trimming/removing trees in preparation for planting in 2011. A working mission, partnerships and collaboration and bio of Farmer Clark is below. The garden name will change to reflect the farm’s mission. If you wish to make an early donation towards this project, you can do so through the Kingston Land Trust. If you have any additional technical questions at this time, please feel free to contact the Kingston Land Trust at rebecca@kingstonlandtrust.org or call their office: 845/877-5263. This is exceptional news for the garden movement in the City of Kingston. The South Pine Street Garden will serve as a model of urban agriculture for the city of Kingston and beyond. 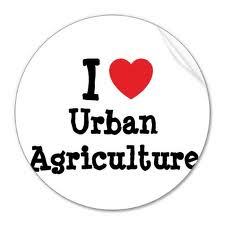 A small scale market garden will show that agriculture can thrive in an urban environment and the site will be a place of learning as well as teaching for community organizations, businesses and schools. The garden and its growers will work in partnership with individuals and organizations in the community to achieve a garden and food based network. Partnerships include: Binnewater Ice Company, The Queen’s Galley and the Operation Frontline Program, the community (*) and the Kingston Land Trust. In particular, an extraordinary partnership between the garden and the upcoming restaurant “Rosemary” is planned wherein the garden would provide featured produce to this high profile, innovative Kingston restaurant and the garden would also serve as a learning space for the restaurant staff. (*) We will encourage members of the community to participate in the garden through volunteerism, workshops and organized garden “work and play” parties. Jesica Clark has worked in farming and small scale agriculture for eight years. She has organized community gardens, managed a small diversified farm in the Hudson Valley and worked for several for-profit as well as not-for-profit, educational farms. Having grown up in New York City and apprenticed in central Pennsylvania, she has experience in both urban culture and rural living. She is comfortable working with all members of a community and feels that good food is integral not only to physical health but also to social health. Cast an Educated Vote on November 2nd, 2010. Here’s How. Last week, I poked around in search of a list of all the candidates running for office this election cycle to share on KingstonCitizens.org. What I learned was how difficult (and that day impossible) it was to find – and with only 1 1/2 weeks away from an important election. Once, the League of Women Voters provided an impressive run down of all of the candidates and their platforms. Also included were candidate questions and answers as well as a thorough text of each candidates past record to help citizens be better informed. Where was it? Sure, I could have put together a list of each individual candidates websites. But a one sided point of view wasn’t going to help you in your decision making process. In some circles, voters are told to ‘vote across the line’. All that is is a party tactic that encourages voters to not be educated ones, further diminishing the process. I came across the phone number of Dare Thompson (what a great name, yes? ), the president of the League of Women Voters and decided to call her to see what I could find out. Luckily, she was home – and we had a wonderful discussion. Dare was surprised that the ballot that once existed on the Ulster County Board of Elections site was not working correctly. When we finished our conversation, she contacted them immediately and was able to work with them to straighten it out. No one had caught that error until that moment. What does that tell you? It’s repaired now, and you can easily access the names of everyone running on the ballot. The process here does ask that the resident do some investigative work, and there is still time to do it. Research the names on the ballot. Not only the candidates you are not familiar with, but those that you think you know as well. 3. Put in your zip code, street number and street name. 4. You’ll be taken to a page where you’ll find all important voting details. Look for the ‘Sample Ballot’ box on the left hand side and “click here” to see a sample ballot. The list of candidates you will have to choose from are there. Print this out, and do some research while there is a little time left. If you have any additional tips for readings in finding good information, please include it in the comment section of this post. Sometime back, I learned of what I believe to be a $1.3 million dollar amount (in state/federal funding that has grown since) slated to be used to restore and upgrade the current Pike Plan located in Uptown, Kingston. This sort of ‘canopy’ was popular in and around the 1970’s, when Main Streets were looking for ways to compete with the fairly new “mall mentality”. Today, Kingston’s Pike Plan is seen by many as nothing more than an idea that didn’t stand the test of time and is now backfiring. Its canopy covers both sides of Wall Street’s sidewalks between John and North Front, and creates a dark and decayed feeling that many feel is hurting what business we have in the Uptown area. Those in support of the development say that the Pike Plan is ‘historic’ and worth preserving. The Uptown area where it is located is deemed historic, it is true. But there is nothing historic about the Pike Plan. Furthermore, I have been told that the canopy is one of the last (if not the last) left in the Country. That might seem like a good thing, except the reasons they were torn down to begin with was mainly due to their being a deterrent to foot traffic and to business in general. I learned that the ever impressive KURA (the Kingston Uptown Resident Association) has serious reservations of this project moving forward. 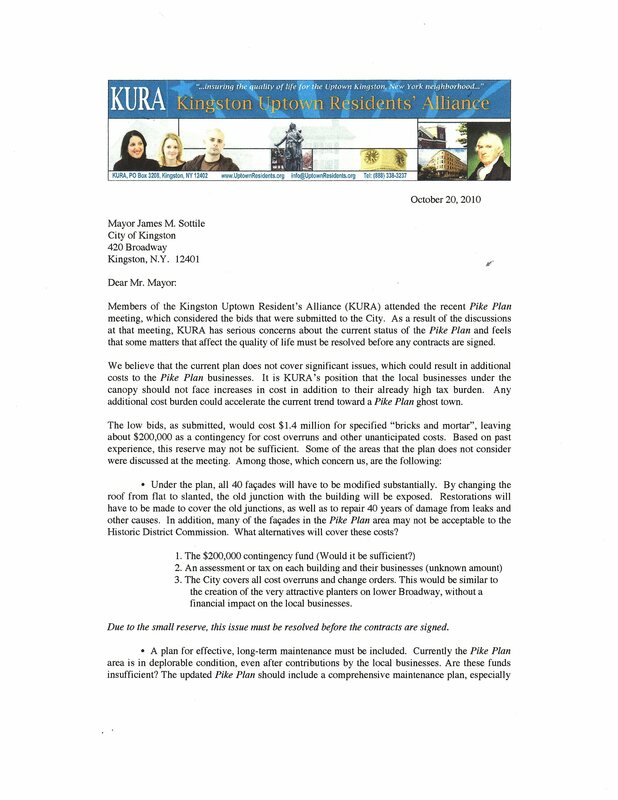 The letter was written to the Mayor by Gerard T. Soldner, President of KURA. His findings are significant. I wish those who are so keen on this project might have had the same enthusiasm for saving what was truly historic – the old Trolley Barn on Broadway and W. Chester Street. Their lack of vision now provides residents with another drug store chain. The third within a one mile radius. Are those at the helm following the money, or are they doing what’s right by the uptown residents, businesses and citizens of Kingston overall? I’m not so certain. But what do I know? Since this was posted, we made a few changes to it by adding a ‘visual’ of the letter written by KURA. 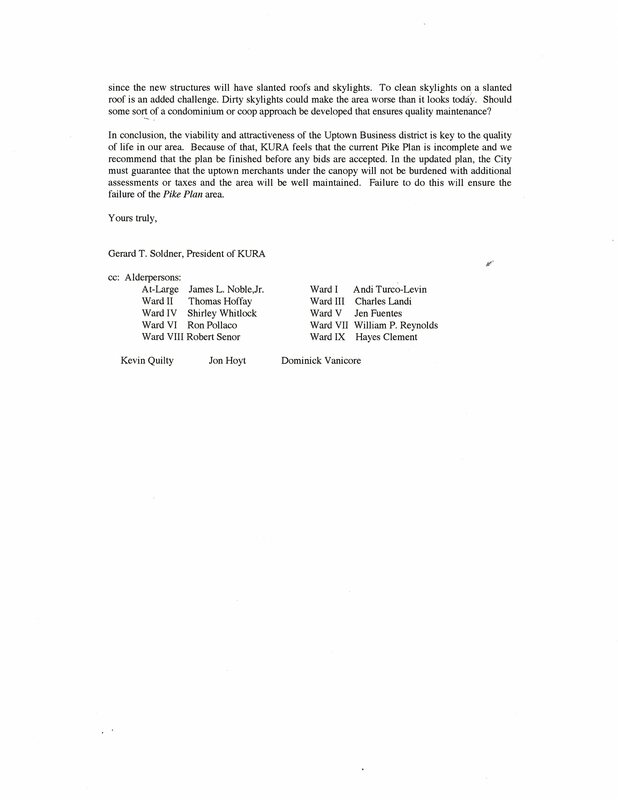 We expect to also include the petition of businesses and building owners concerned with the current Pike Plan effort. Congrats to the organizers of the Bluestone Festival for a successful year! With little to no budget, they pulled it off in 2010 without a hitch, and beautifully so. Special thanks to the Maritime Museum and all of the performers and presenters that gave their time and talents that day. A video promoting the upcoming O+ Festival, and some of why Kingston is a very special place to live. Take note, NYC. We’re 90 minutes North. That’s all. Ad For The City Of Kingston, NY, And The O+ Festival from The Mystery of Creativity on Vimeo. WBPM 92.9 annual Rally for the Galley radiothon continues today, Saturday October 2nd. 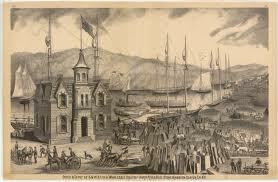 Now is an important time to make a donation to support the Queens Galley. on rte 9w in Kingston with electric morning show hosts Jack Hammer and Andre Kane and Randy Turner with many special guests.